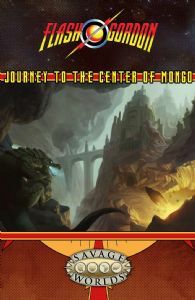 Journey to the Center of Mongo is an epic serial for The Savage World of Flash Gordon™ presented in six thrilling chapters! Your heroes travel into an uncharted realm: the Subworld of Mongo, home of Wandu, the crystalline kingdom of the mysterious mole-men. CHALLENGE these strange subterranean dwellers! CONFRONT ravenous, rock-eating tunnel gators! COMBAT Ming’s soldiers for control of a massive white sapphire mine! While this campaign is designed to be run end-to-end, there are a few places where you can insert your own side-jaunts within this strange, unexplored realm.